The whole point of a greenhouse is creating the ideal growing environment for your plants. 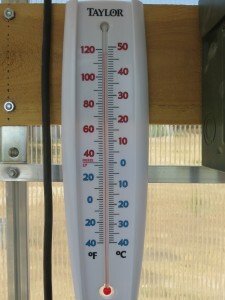 The most important factor of the growing environment is the temperature. There are many ways to maintain proper temperature, but here we’ll cover ten ways to keep the temperatures just right, automatically. Electric Space Heaters. This is a basic idea, and there are as many kinds of electric space heaters are there are greenhouses, probably more. In order to have any automation of the temperature control, the space heater will need to have it’s own thermostat. Larger greenhouses will need larger heaters, or more of them. Thermostat controlled power outlets. If you’ve got a powerful electric heater, but it has no thermostat, you can plug it in to a thermostatically controlled electrical outlet. These can be plugged into an ordinary outlet, then you set the desired temperature and leave the heater’s power switch in the on position. Propane Space Heaters. If your greenhouse has no electricity available, you might need to get a propane powered space heater. The drawback of course, is that you’ve got to ensure it’s always got enough propane to keep going. Heated pots. There are even heated pots available to keep individual plants warm. These don’t really affect the whole greenhouse. But if only some of your plants need to be kept warmer than the others, this might be the right method. Soil Heating Cables. These cables will keep the soil at ideal temperatures automatically. Some are not adjustable, set to a static 70F for example, but others allow setting a range of temperatures. Auto-opening vents. These are pretty neat. They automatically open and close vents, without any external power source. When the temperature reaches the adjustable or preset opening temperature, the vent will begin to open, reaching fully-open status after the temp rises another 20 degrees or so. Thermostatically controlled fans. If the vents being open isn’t enough to keep the temperature right, you may need some fans to get the air moving. You can either circulate the air inside the greenhouse, or direct the fans to push or pull air through the vents. Powered shutters. These are vents, usually mounted vertically, that will be opened by an electric motor at a specified temperature. If you have a natural breeze available, installing these in the right direction on your greenhouse can allow the breeze to cool things down. Fan-shutters. This combines the shutters and a fan. But these shutters open automatically by the force of the fan pushing air through them. When the fan is off, gravity pulls them shut. Greenhouse Evaporative Air Coolers. Evaporative air coolers use air and water together for maximum cooling power, short of an air conditioner. A powerful blower pushes air over pads which have water pumped over them. The water forcefully cools the air to actually lower the air temperature before blowing it out. These are more expensive, so you’ll only want to use them if maximum cooling power is required.